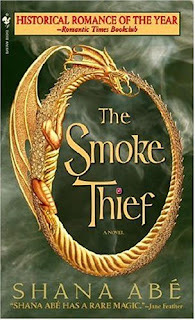 Dubbed the Smoke Thief, a daring jewel thief is confounding the London police. His wealthy victims claim the master burglar can walk through walls and vanish into thin air. But Christoff, the charismatic Marquess of Langford, knows the truth: the thief is no ordinary human but a “runner” who’s fled Darkfrith without permission. As Alpha leader of the dra´kon, it’s Kit’s duty to capture the fugitive before the secrets of the tribe are revealed to mortals. But not even Kit suspects that the Smoke Thief could be a woman. Clarissa Rue Hawthorne knew her dangerous exploits would attract the attention of the dra´kon. But she didn’t expect Christoff himself to come to London, dangling the tribe’s most valuable jewel–the Langford Diamond–as bait. For as long as she could remember, Rue had lived the life of a halfling–half dra´kon, half mortal–and an outcast in both worlds. She’d always loved the handsome and willful Kit from the only place it was safe: from afar. But now she was no longer the shy, timid girl she’d once been. She was the first woman capable of making the Turn in four generations. So why did she still feel the same dizzying sense of vulnerability whenever he was near? From the moment he saw her, Kit knew that the alluring and powerful beauty was every bit his Alpha equal and destined to be his bride. And by the harsh laws of the dra´kon, Rue knew that she was the property of the marquess. But they will risk banishment and worse for a chance at something greater. For now Rue is his prisoner, the diamond has disappeared, and she’s made the kind of dangerous proposition a man like Kit cannot resist....In this bewitching novel, Shana Abé transports us into a world of exhilarating romance and magic. Shana Abé is the award-winning author of nine novels, including The Smoke Thief. She lives in the Denver area with four surly pet house rabbits, all rescued, and a big goofy dog. Please, please support your local animal shelter, and spay or neuter your pets. When I was a little girl, I used to write stories about my teddy bear and soft toy rabbit—Bingo and Charlie. These two deceptively innocent little creatures didn’t spend their time enjoying dolls’ tea parties or playing with their friends like normal toys. Bingo and Charlie fought off alien invasions, battled the fairies at the bottom of the garden and generally had a smashing time and horrified my teachers. After earning a degree in Botany and Zoology from London University, I dabbled in accountancy and then worked in sales and marketing in the pharmaceutical industry. Eighteen years ago, I discovered my entrepreneurial spirit and set up a business with my husband providing a pest control service to other businesses in the South West of England. Having faced rats the size of cats and all manner of creepy crawlies, I’ve seen sights that would curl your toes, turn your stomach and maybe send the more sensitive among you screaming from the room—or at least leaping for the nearest chair. With the business thriving, and my two children becoming more independent, I hit the dreaded four oh, and decided to ‘find myself’. My search for a new direction eventually led me full circle back to my childhood love of creating stories. Unfortunately, my initial inspiration, Bingo and Charlie, are long gone. (Actually, I hate to admit this, but Bingo is extensively patched and languishing in a wardrobe in the spare room, and I haven’t a clue where Charlie is—what a bad mommy I am!) I’m lucky enough to live near Plymouth in Devon close to the windswept expanse of Dartmoor (and yes, I have plans for a story set there very soon). As well as my wonderful long-suffering husband, and two children, I share my home with two Shih Tzus and an aristocratic chocolate-shaded-silver-burmilla cat who rules the household with a velvet paw. I love to write about the locale and places I’ve visited. My dark fairy story is set in Cornwall and Ireland, and France is the main location for my demon story. My favourite spot is in front of a computer. I freely admit to being addicted to creating stories. My time is spent studying craft, writing, revising, and persevering. I strive to achieve excellence by applying the same passion and determination with which I developed a successful business. I'm delighted to announce my paranormal romance THE MAGIC KNOT has won the American Title IV contest. The book will be released on January 27th by Dorchester Love Spell. The Magic Knot was also a Golden Heart® finalist for 2008 in the Paranormal Romance category. Go to buy Her Book At Amazon or Barnes and Noble. What reviewers are saying about The Magic Knot. "I picked up this book, started to read and didn’t stop till I read the last page, closing it with a sigh of pure ecstatic, heart-warming bliss... A stunning debut for an author who instantly became a permanent addition to my bookshelves!" "The incredible ending left me gasping quietly at the sheer beauty, imagination and imagery." "Ms. Taylor has written a story filled with love, magic, and adventure. I began reading this book in the morning and remained captivated until the very last page." What's your faverite Mostly for read?